Jewish settlement came comparatively late to Blytheville, a small town tucked away in Mississippi County in the northeastern part of Arkansas. Located on the Arkansas side of the Mississippi River Delta, the town began to grow in the late 19th century as the region emerged as one of the country's most fertile cotton growing areas. The cotton industry was the economic magnet that began to draw Jewish merchants to the area in the early years of the 20th century. Jews began in Blytheville as merchants and sometimes got directly involved in the local cotton industry. Silvey Sternberg, who grew up in Fort Smith, became a successful cotton broker and built one of the largest cotton ginning businesses in the area. The Sternberg family was very civic-minded, donating free milk to the town’s school kids. Silvey’s wife Mollie was very involved in local society, and helped to organize the Blytheville Women’s Club. By the 1930s, there were over 24 Jewish-owned businesses in Blytheville, which had became a cotton trading hub. Siegbert and Richard Jiedel opened the Jiedel Cotton Company, which brokered the Delta’s main cash crop. 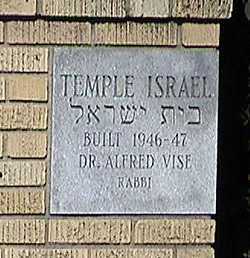 Richard also owned a dry goods store and both brothers were longtime leaders of Temple Israel, the local synagogue. Other local merchants included Walter Rosenthal, who owned a ladies clothing store, Jack Applebaum, who once served as head of the local chamber of commerce and whose two brothers also owned stores in town, Sam Joseph, who owned a hardware and paint store, and Joe Isaacs, who began as a peddler and later became a successful merchant and cotton broker. Building on his success as a merchant, Isaacs got involved in banking, and helped to found First National Bank in Blytheville. 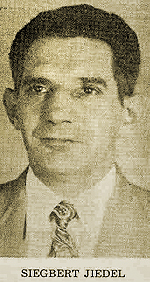 Samuel J. Cohen was a prominent member of the local Jewish community who did not fit the retail merchant pattern of so many of his fellow Jews. Cohen was a professional engineer who had been trained in Russia before immigrating to the United States. In Blytheville, he helped to design area drainage canals, levees, and highways. His son Jerry came back to Blytheville after college and worked as an engineer with his father. Jerry Cohen’s daughter, Marcie Cohen Ferris, has become a leading scholar of Southern Jewish foodways and culture. Her book, Matzoh Ball Gumbo, was inspired by the recipes of her grandmother, Luba Cohen. Oscar Fendler was an attorney who became very active in prison reform in Arkansas. He helped to close down several penal farms in the state due to their substandard conditions. In 1963, he served as president of the Arkansas Bar Association. Fendler was a strong advocate for Blytheville, and used to his influence to help keep the local Air Force open for many years after World War II. Although the Ku Klux Klan was active in the area in the 1920s, Jews were for the most part welcomed in Blytheville. They were allowed to join the local country club and became active in civic organizations like the Masons, Elks Club, Garden Club, and the Women’s Club. Most of the Klan’s efforts in the 1920s were focused on African Americans and Catholics. Anti-Catholic sentiment became rather strong in Blytheville during that decade, leading one local Jew, Walter Rosenthal, to resign from the Mason’s Lodge due to growing anti-Catholic sentiment within the group. In 1927, seventy-one Jews lived in Blytheville. Their numbers increased to about a hundred by 1937, and remained at that level for the next few decades. Since Blytheville’s Jewish community was not founded until the early 20th century, most of the early Jews who settled there were immigrants from Eastern European. In 1918, Jewish men in Blytheville founded a local chapter of B’nai B’rith. Five years later, Jewish women in town founded a Ladies Aid Society, which would prove to be the catalyst in the Jewish community’s development. In 1925, thanks to the efforts of the local Ladies Aid Society, Jews in the area had founded a religious school and a congregation, later known as Temple Israel, which served Jews from surrounding towns in Arkansas and Missouri. After World War II, Blytheville’s Jewish community enjoyed a brief resurgence. They built a new synagogue in 1947, but by the 1950s the community had gone into decline due to changes in the local cotton economy. The Arkansas Delta became an impoverished region with little economic opportunity for Jewish merchants. By the 1990s, only three Jewish families remained in town, with many Blytheville Jews moving to nearby Memphis. In 2003, they closed the synagogue for good, formally dissolving the local Jewish community.